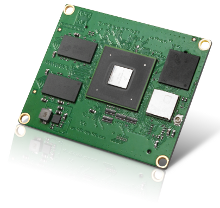 The APF6 is a reduced size single board computer running Linux and benefiting from impressive performances. Fitted with a up to 1GHz i.MX6 (Cortex A9) processor, with 1, 2 or 4 ARM cores, 512 MB to 2 GB DDR3 RAM, 2 to 64 GB eMMC, a Gigabit Ethernet port, 1 USB2.0 high speed port including PHY, one USB OTG port including PHY, optional Wi-Fi b/g/n and Bluetooth 4.0 peripherals, it is easily integrated into an embedded system. Note : no external debugger (BDI, JTAG) is required. When it is used with the APF6_Dev board, a simple USB wire is enough for "low-cost" development. A Linux debugger is available (GDB). Armadeus systems provides a complete Linux distribution (Click here for more details). All the development tools are already included. The boards are shipped with pre-installed U-Boot and Linux . (3) Available on i.MX6 dual and quad only (D and Q options). (4) Not all peripherals can be simultaneously active due to pin sharing. Please check the i.MX6 documentation for details.